Places in town + prepositions (next to, between, opposite) + there is/are. 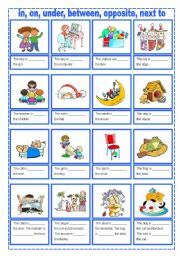 The vocabulary is from "Happy street 2" unit 5. The pictures are from http://www.fotosearch.com. Editable. 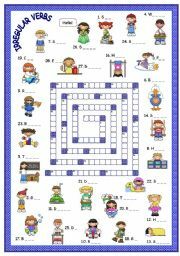 First, children have to complete the verbs (infinitives) next to the pictures, then they have to write the past form of those verbs into the crossword. 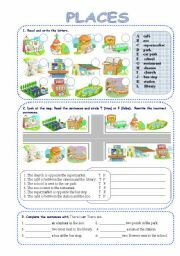 The second part is here: http://www.eslprintables.com/printable.asp?id=291639#thetop Check it before giving to your pupils, please. 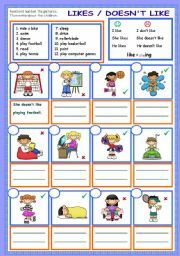 Children read the verbs, number the pictures and write sentences about them. 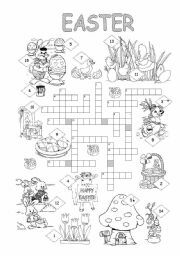 Easter crossword with some information about Easter symbols on the second page. 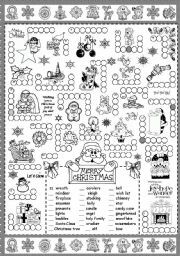 Answer key is included but this time not in a crossword form. I had to type it as the file was too big. First of all children have to write the singular of the given noun next to the picture. 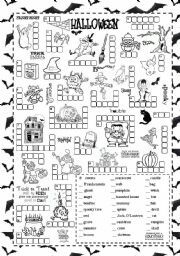 Then they have to complete the crossword with the plural form. Check it before giving to your pupils, please. Editable. Page 1: in, on, under, next to, opposite, between. 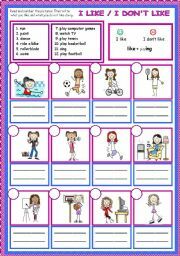 (Another ws with the same prepositions you can find here http://www.eslprintables.com/printable.asp?id=166436#thetop) Page 2: behind, in front of, above, next to, opposite, among, between. Check it before giving to your pupils, please. Editable. 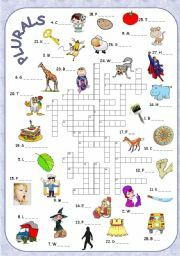 First, children have to number the pictures. Then they have to write about themselves: what they like doing and what they do not like. Places. Please check it before giving to your pupils.